As is the current trend with animated feature films, viewers are treated to a preceding short film, which may or may not be related to the main feature. For Illumination Entertainment, the studio behind Despicable Me, The Secret Life of Pets is its seventh full-length feature release, and its accompanying short, Mower Minions, is the studio’s first short. Oh, and it stars the studio’s poster boys, a.k.a. 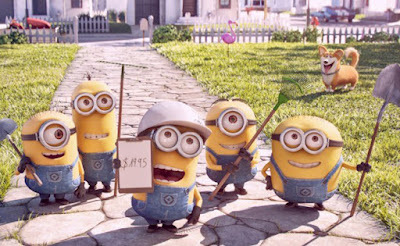 the Minions. The short starts out in the Minions’ living room, where they are watching a home shopping channel selling blenders. Realising that they would need this to make banana smoothies, they break open their piggy bank to see how much funds they have. Of course they don’t have any money, so they decide to do some manual labour to earn some extra income. So they head over to Fuzzy Memories Retirement Home to do some yard work, but instead they wreak havoc. What did you expect with Minions and power tools, anyway? What they actually bring to the senior citizens isn’t cleanliness; it’s happiness. Turns out the oldies haven’t laughed hard in a long time, and so the Minions get paid for their destructive antics, which they use to purchase their blender. Like with babies, the more time you spend with Minions, the more their speech becomes intelligible, and you find yourself recognising more and more words from their very strange and limited vocabulary. But like with true slapstick comedy, words aren’t necessary, as the hilarious actions speak volumes. In Pixar’s case, the accompanying short films tend to serve as the training ground for directors who will eventually move on to direct their full-length movies. In Illumination’s case, it seems that the shorts serve as nothing more than extra time for the movie patrons to make it to their seats. 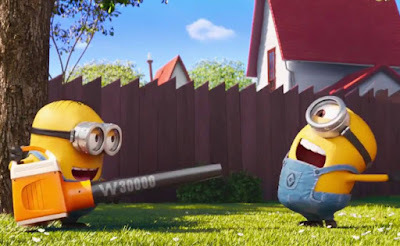 Mower Minions is still entertaining, though, don’t get me wrong. But if you’re looking for something that could get an Oscar nomination for Best Short, you’re not going to find it here. Unlike that leaf blower, this short won't blow you away.